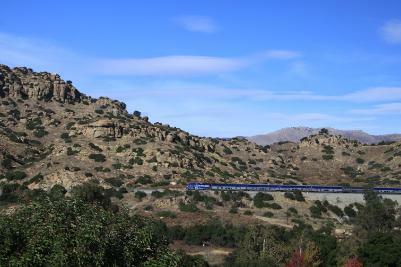 The Santa Susana Pass State Historic Park (SSPSHP) is uniquely situated adjacent to a major population center, Los Angeles, California. The park is in Chatsworth, and therefore primarily is within the City of Los Angeles. A small portion is under jurisdiction of the County of Los Angeles, and a small portion is within Ventura County. The rich and varied geography of the SSPSHP provides an abundance of California history – all walkable within the span of a single day. 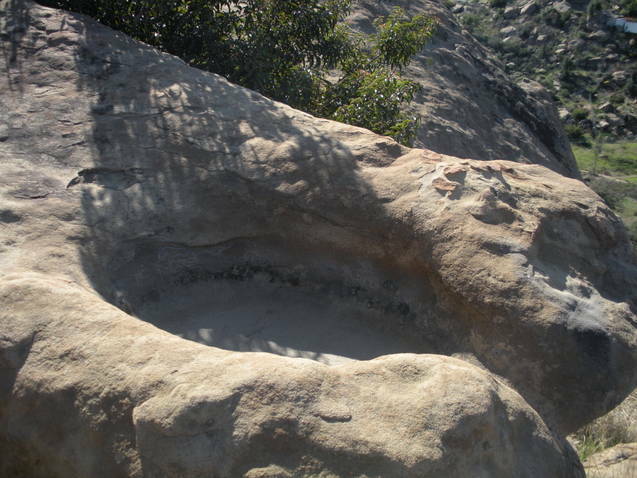 The Santa Susana Mountains and Simi Hills abound with evidence of Native Americans. Collectively called the Chumash, the specific bands residing in the Chatsworth area include Fernandeno, Eastern Chumash, and perhaps Tataviam as well. 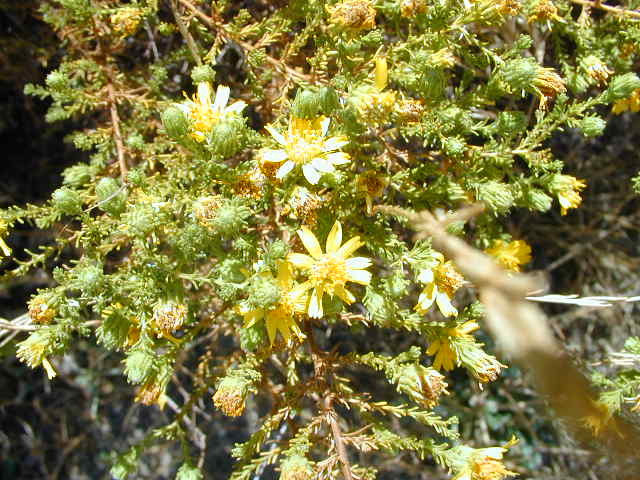 Chumash have inhabited the area for at least 23,000 years. The earliest archaeological evidence, in the form of a physical location, dates to before 6,000 B.C.E. (Before the Common Era). This period is called Horizon I, and is exemplified by a generalized food gathering existence. Not much is known about Horizon I, which is partly due to its great antiquity. The next period is called Horizon II, or Early Milling Stone Horizon. Dates for the period range from 6,000 B.C.E. to about 500 B.C.E. 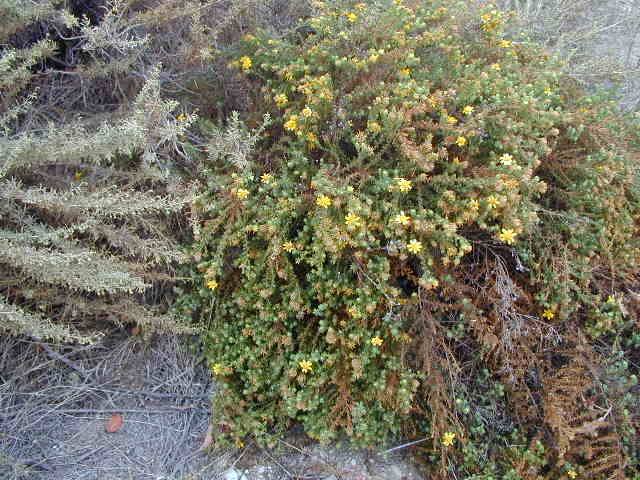 This period has much information available, and is characterized by a partial exploitation of the area as a food source. The dominant foods were wild seeds supplemented with shellfish. The next period is called Horizon III or the Intermediate Horizon. This period lasted from about 500 B.C.E. to about C.E. (Common Era) 1000. This horizon is poorly understood, but seems to be the period when hunting increased and the acorn is introduced as a food resource (acorns abound in the SSPSHP. 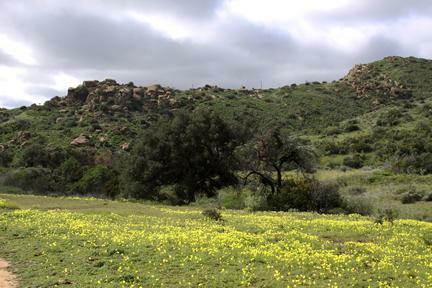 Acorns were the staple of the Chumash diet in the Santa Susana Mountains and Simi Hills. Acorns were harvested in the Fall and carried in baskets to the village and dried. When they were ready they were cracked open and the nut meats ground or crushed into flour. Only one quality marred the meal. Acorns contain tannic acid, which tastes bitter. The Chumash solved this problem by leeching out the acid. The process of leeching involved putting the acorn flour in a scooped-out hollow in the rock and pouring water on the flour until the tannic acid was removed. 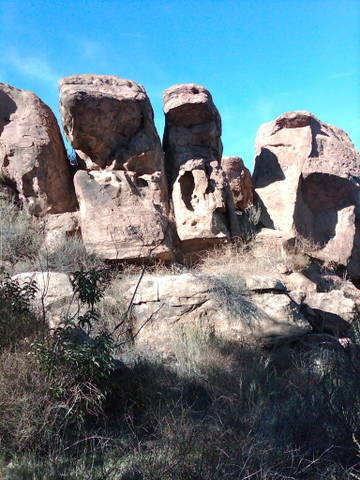 The scooped-out hollows remain, and can be seen in the rocks along the trails in the SSPSHP. As archaeologist Albert Knight once observed, "If you see a rock that is waist-level, chances are that the Chumash used it for leeching acorns or drying hides. The final prehistoric period is called Horizon IV or the Late Pre-Historic Period. It dates from about C.E. 1000 to about C.E. 1800. This seems to be a period of gradual cultural elaboration. Food getting techniques are refined and almost all available food resources are utilized. Subsistence is still entirely based on hunting and gathering. There is evidence that the large concentration of Tribes in the Santa Susana Mountains/Simi Hills was the cause for an early trade route. A.S.C. Forbes in Grizzly Bear magazine reported the trade route as early as 1900. The Chumash trade route may have accounted for the choice of the Devil’s Slide stagecoach route across the Santa Susana Mountains in later years. The Cuesta Vieja was used as the principal stagecoach route between the Los Angeles area and San Francisco. The steepest part of the route is still called the “Devil’s Slide.” This was a fearsome trip for this type of conveyance and we have stories that tell how it was accomplished in 32 days! Today the Old Stagecoach Road (El Camino de Santa Susana y Simi) is a modern hiking trail and is listed on the National Register of Historic Places. It is also a Los Angeles County Cultural-Historical Monument (#92). "All that the [stagecoach] travelers need to render himself comfortable is a pair of blankets, a revolver or knife, an overcoat, some wine to mix with water, and three or four dollar's worth of provisions. Meals can be had at all stations." In the early 1900s, a mile long train tunnel was put through portions of the park. These tracks are still extensively used today as a major route between Los Angeles and San Francisco – so plan on hearing many long train whistles during any day at the park. The park’s area originally had several springs and viable wells for early settlers and the Native Americans. However, the new train tunnels completely changed the water situation. As the tunnels were dug, the aquifer was pierced and the tunnels had problems dealing with too much water – to the detriment of those around them. The dominant geological feature of the SSPSHP is a natural rock formation, now called the Chatsworth Formation, that is characterized by sandstone boulders slanted to show an approximately 30 percent grade throughout the foothills that surround the park. In portions of the park, volunteer interpretive leaders can tell you about how modern man thought he could use the sandstone, but ultimately failed, leaving these giant boulders in place today. Smaller piles of boulders blown from the rock faces show evidence of quarry operations that were in the area in the early 1900s. Lastly, the area north of this park was extensively used in the movie industry. 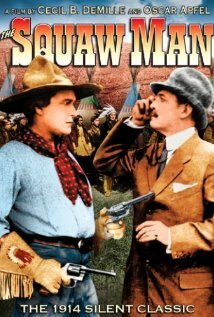 The first film shot in Hollywood was filmed on location in these local mountains, "The Squaw Man" by Cecile B. DeMille. Our mountains are the iconic backdrops that most Americans think of when they envision the "Old West." Iverson Ranch was along the north edge of the park, along with Garden of the Gods, and many of the older westerns have scenes shot from these locations. Today, the park serves an important link as one of the undeveloped areas that surround the San Fernando Valley, and it is a part of a key wildlife corridor that allows animals and plants to move between the mountains north of the 118 Ronald Reagan Freeway to the Santa Monica Mountains. Preservation of genetic diversity is important to the long term health of the native populations. 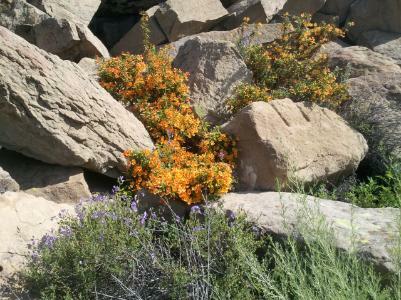 The park provides excellent habitat for a California-listed endangered plant, the Santa Susana Tarplant – it likes to grow in the sandstone rocks that are typical in this area.